As of August 2015, there were more than 50,000 references involving the Zetasizer on Google Scholar. When you are reading this, check it live, and it may already be a few more than indicated on the screenshot. As the pace of scientific research & discovery continues, the number of publications should continue to rise. At what rate is not easy to predict, however, the year so far has been quite prolific. There are 7370 results reported for this year as of 21 August 2015, which is the 233rd day of this year. 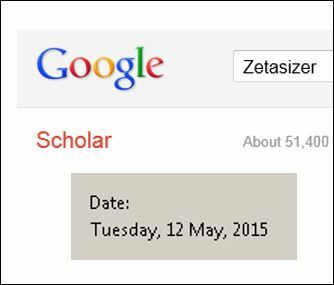 In other words: there were 7370/233=31.63 additions per day, or more than one publication every hour. 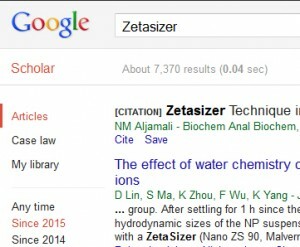 On average, every 45min 32sec somewhere around the world a citation involving the Zetasizer gets published and discovered by a google crawler. Quite amazing! Congratulations to everyone who has contributed and helped achieve this overwhelming success for the Zetasizer light scattering system.